Human Traces is a strange book: I was torn between admiring it very much and wishing it would hurry up and end so that I could read something else. It’s a long book at 608 pages in the edition I read, but long books are usually no problem, especially not if they are written in the style of the traditional 19th century novel. I grew up on the 19th century novel, and I like its certainties and its style, especially for comfort reading. Faulks has recreated this style almost as if he had travelled in time, and the world he creates is compelling and believable. The problem derives from the 19th century quest to understand the mind and madness, which drives the novel. Two young men, Jacques Rebière and Thomas Midwinter, share the ambition to find a cure for the madness that made them doubt the existence of God. To make this real for the reader, Faulks takes us through the history of managing mental illness, starting with Jacques’ brother Olivier, chained in a barn on the family farm, and moving on to Thomas’s first job in a vast English asylum where the descriptions of how the inmates were treated will haunt you. But the author also devotes long pages to explaining the 19th century theories about mental illness, dressed up in the form of didactic digressions, as when Sonia, Thomas’s sister and eventually Jacques’ wife, is given a crash course in understanding medical terms so that she can understand their work. There are speeches and papers at public events, and internal monologues which reveal the thoughts and anxieties of the two young doctors too. And, as you might expect, there are also sequences of dreams and interpretations, although Freud is present only for his Oedipal theory to be mocked by Thomas, who believes in biological causation of mental illness. (Which brings him into conflict with Jacques, who supports the coexistence of these competing schools of thought). Unless you are very interested in theories which are now long out of date, or you enjoy searching for premonitions of contemporary knowledge about mental illness, these long digressions are tests of patience. Which I sometimes failed. Trust me, it is rather chastening to plod through page after page of a pedantic speech, only to find at the end of it, that I didn’t know what the point of it was. I could not face re-reading it even though I suspected that it was important to the design of the novel. I found myself anachronistically wishing that he had used PowerPoint so that I knew what it was I was supposed to have understood). On the other hand, there are moments of magic when the characters convincingly rise above their era to perceive the humanity of the patients they see despite the wretched circumstances of their existence. Although Thomas and Jacques do not find the elusive ‘cure’ and they diverge in their theoretical beliefs to the point of estrangement for a while, both realise that ‘simple kindness’ and tolerance of otherness are in themselves a powerful remedy. Much as they would like to move beyond ‘mere mapping’ like the cartographer in Africa, they have to content themselves being able to understand … what is in the world, and to pass [that ]understanding on, entire and without compromise, to those who follow. (p. 442) Yet even a limited ambition like this falters in the wake of diminishing confidence, Thomas in his fifties failing to publish anything after his catastrophic failure with Jacques’ brother, and Jacques compromised by his near fatal misdiagnosis of a patient who remains nearby to remind him of it. The love story which frames the story works well because the characterisation is superb. English fails me here: we need another word for ‘love’ to capture the profound affection these men have for one another. The bond they share is more than a professional relationship of shared ambition and idealism; more than a proxy brotherly love which makes them tolerant of each other’s faults and able to sustain the relationship despite hurts and misunderstandings; and more than the romantic, uxorious (mostly faithful) love they feel for their wives. Faulks captures the ambition, intellectual exhilaration, compassion, kindness and stubborn determination of this male friendship in a way that is rare today, when the zeitgeist is preoccupied with revealing diversity in human relationships. Human Traces is a big, ambitious novel which apparently took years to write. Despite its flaws, it’s still well worth reading. Source: loan from a friend, thanks, Lurline! I listened to this on audiobook years ago and had a very similar reaction to you – long tedious themes held up by sections of brilliance. 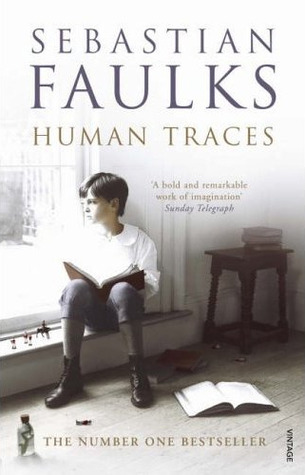 It was the first Faulks book I didn’t love cover to cover (so to speak) so I was a little disappointed. The historical aspect of treatment of mental illness and the background story made it a worthwhile but not perfect read. I think it would be unbearable as an audio book. I mean, I’m not recommending that people skip bits (though I’d understand if they did) but you can ‘glide’ through pages of a boring bit whereas you are stuck with it if you’re listening to it. It reminds me of Roberto Bolano’s Savage Detectives which I listened to as an audiobook – and there are literally pages and pages of Mexican poets you’ve never heard of, it went on forever but at least that was kind of hypnotic – and more importantly, it wasn’t necessary to make sense of a list of names in the way that you need to make sense of a long speech. I think my father read this and liked it. I’ve often thought about it, but haven’t got it and so probably won’t! I think I’d need stronger recommendation to face over 600 pages! And yet, the topic does intrigue me. Oh, and I do love 19th century novels – and I do read long books (Wolf Hall, A fine balance, The luminaries) but I think about it seriously before I do. Yes, I usually save long books for when I can read them uninterrupted. If you can only read for about an hour or so each day, reading a long book can take a fortnight, and I find that’s too long to be absorbed in just one book. Yes, I think that’s part of it. Even though I’m retired many days I only manage half an hour’s reading before I go to sleep. I can’t believe it really, but that’s how it is. When you come across a book that’s difficult do you change your reading patterns? I find it helps to read it in smaller chunks and maybe read it alongside something more interesting. I’ve only read Birdsong by Faulks. Other than that one he is an author that doesn’t really appeal to me for some reason. If you liked Birdsong you would probably also like Charlotte Gray. Just saying☺. Yes, I’ve read those two, and enjoyed them both, though I thought that Birdsong was better than Charlotte Gray. I’ve only read A Week in December and Human Traces and neither were outstanding. Birdsong is one of my top 2 favourite books of all time. That didn’t really make sense. Obviously I have also read Birdsong and Charlotte Gray! Yes, I think I do, Jonathan. It depends a bit on what it is. I’m usually reading something else as well anyway, at least one non-fiction book over breakfast, and if it’s a big thick lightweight book I might balance it with something more challenging but short, or vice versa. I’d recommend you check out Faulks on Fiction, if you get the chance. I really enjoyed it because he discusses a lot of the books I’ve read, and he’s a fan of character-driven novels and so am I. Thanks for the Faulks on Fiction recommendation, I’ll have to track a copy down. I’ve had problems with books at the moment, where I’ve either just given up on them, read part of them or skipped huge chunks. I’m reading Zola’s Rome at the moment and it’s quite a dull book. I’d intended on powering through it but I’ve found I can only take about a chapter a day, which means it’ll take longer to read than expected. I usually prefer to concentrate on one book at a time but I’m finding advantages in having a couple on the go at the same time.